Olivia Wilde attended the 9th annual Veuve Clicquot Polo Classics on Saturday(October 6th) at the Will Rogers State Historic Park in Pacific Palisades, CA. While we are entering fall, Olivia worked a look hot off the SPRING 2019 runways. 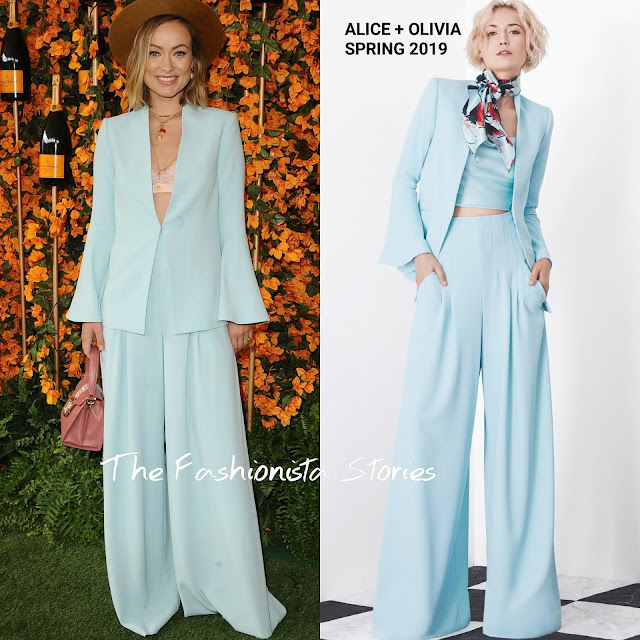 Flashing her bra thanks to WEAR COMMANDO, she wore a ALICE & OLIVIA light blue bell sleeve jacket which was teamed with the matching wide-leg pants. I feel like almost every time a celeb is wearing wide-leg pants, they are unhemmed. Despite that, I like this chic, flirty look which was accessorized with FOUNDRAE necklace, a pink bag and a brown hat.